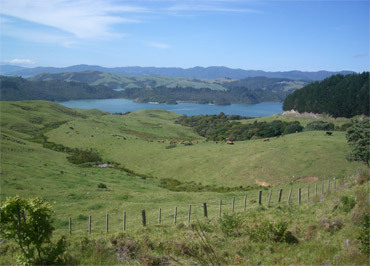 A view from the Coromandel Peninsula in northern New Zealand. I never had much interest in history, with the lines of succession and battles over borders always boring me. And even monumental achievements like fine castles and grand cathedrals only hold my attention for a short while. But our traveling life has made it crystal clear that I am fascinated by the ancient beginnings of things, like how, why, where and when ceramics, metals and glass came to be made--and even 'why not' in some instances. "Older is better" for my interest level, but even ancient politics hold my interest only long enough to understand the fundamental differences, like that the Romans were initially driven to expand as a defensive tactic; the Greeks expanded because of lack of food for their ever-growing population; and agriculture made prolific by the annual flooding of the Nile kept the Egyptians content to stay home. Beyond that, their political histories also rapidly become the blur of following family trees that puts me to sleep. But luckily I was wrong--New Zealand has some riveting history--its that it goes back about 85 million years. Suddenly tracing the course of the super-continent Gondwana drew me in, whereas in the past I didn't bother to learn how to pronounce it. Gondwana consolidated as a land mass 680 million years ago and for much of New Zealand's history, New Zealand was a strip of submerged rock debris off Gondwana's coastline. In the course of most of Gondwana's history, life wasn't much bigger or more complicated than that represented by jellies, corals, and anemones. Eventually, New Zealand broke through the water line, then away from Gondwana and was soon on a course for isolation near the south pole, toting the now more complicated life forms, including a few dinosaurs. Breaking off 85 million years ago was pivotal in making New Zealand unique as it headed out before mammals and their cousins the marsupials evolved (or if it had any, they didn't survive). It wasn't until fully evolved humans touched the land that New Zealand had any land mammals. Instead, birds, insects, and a few types of reptiles filled all of the usual ecosystem niches, as well as those of the missing mammals. Birds especially flourished as they had no significant predators. Learning this early history hooked me in and I became intrigued by New Zealand's ancient past and how it is reflected in the flora, fauna, and terrain we were and would be seeing. In our first minutes out of the airport I was struck by the sound of unseen birds--not a usual airport grounds sensation amid the too plentiful exhaust and noise. 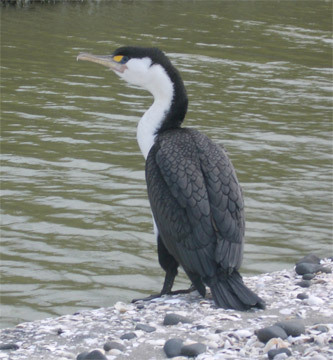 And in the many urban parks we walked through or sat in our first days in Auckland, birds were always a prominent part of the background, constantly reminding me of the country's unusual ancient history. 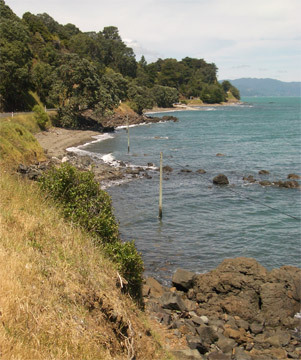 Humans arrived late on the scene in New Zealand and the conventional wisdom is that there were no human settlements, or mammals, in New Zealand until the 13th century ce with the arrival of the bold northern Polynesian mariners in their dug out canoes, probably traveling from the north almost 2,000 miles to get to New Zealand. But as is often the case when we arrive at a location, the less discussed and still debated fragments of history surface. In New Zealand's case, it is the skeletal remains of a special Polynesian rat that muddies the waters, as Carbon-14 dating shows that some of these rats were on New Zealand's 2 largest islands 2,000 years ago. A replica of an ancient navigation chart of sea swells. There is no evidence of human settlement before the 13th century, but Polynesian sailors were on both islands of New Zealand long enough to for this kiore rat to become established at the time that the Romans were expanding their reign in Europe and the Egyptian pharaohs were becoming insignificant. The introduction of the rat created the first of several modern waves of extinctions in New Zealand's massive bird population with the next big extinction occurring after the Polynesians were well settled on the islands. 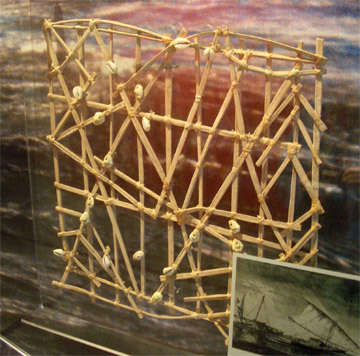 The navigational ability of these early Polynesians was astounding and we'll also be pondering the sea in a new way since learning that the Polynesian mariners recorded their routes in terms of seemingly subtle tracking of phenomena like ocean swells. The sun, the stars, and the swells were reference points and the increasing presence of birds and the clustering of clouds revealed yet unseen land masses ahead of them. As we pedal through New Zealand, we'll be looking for opportunities to learn more about its unusual flora too, as many of the more primitive ferns and conifers on Gondwana were preserved rather than being lost as was the case on the bigger land masses. The still-active volcanic history will catch our eyes and divert our attention with its influence on the roadside geology and some stunning viewpoints. Unexpectedly, there was going to be sufficiently fascinating ancient stories to further unravel in our journey through New Zealand to keep our minds occupied. Our first day's ride southeast out of Auckland was less than 20 miles to Howick. We felt a little sheepish going such a short distance, but the intermittent pounding showers between bursts of sun slowed our progress as they were accompanied by 30 mph gusts. The almost steady 10-15 mph winds were hard enough, but the stronger blasts had us giving second thoughts about being in New Zealand for 4 months. And the need to make reservations a week in advance would test our meddle as we struggled to stay on schedule on days like this. Little did we know that the winds sucking the day's heat out of our motel room at dinner time were lifting roofs in the form of tornados in Auckland proper. Wind gusts between 60 and 90 mph were lashing the city. The landmark tower like Seattle's Space Needle was closed as a precautionary measure as it was swaying to a worrisome degree. We were disheartened to realize that none of this had been predicted on the 2 online weather forecasts Bill had checked that morning or on the TV news, giving us little hope of adjusting our schedule in the future to the latest weather conditions. But we felt lucky that visiting the Howick Historical Village had pulled us off the road early that day. Arriving later than we hoped because of the winds, we postponed our visit until the morning. 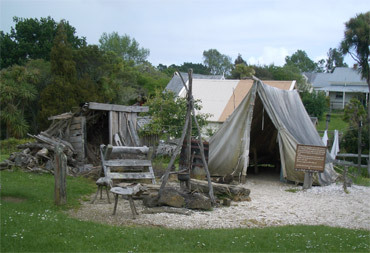 Howick was the largest of 4 defensive communities that the Brit's established south of Auckland to protect the new city from Maori attacks in the late 1840's. Staffed by the "fencibles" or retired military men, the communities weren't forts but a somewhat protective line. "Fencibles" were also sent to Australia, Canada and the Falkland Islands as settlers for defensive purposes. In New Zealand they and their families swelled the size of the migration to 2500, about doubling the European population of New Zealand at the time. 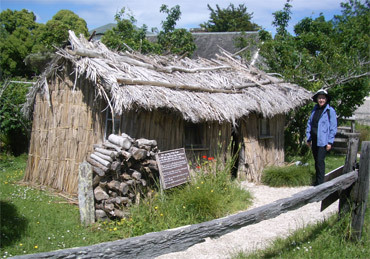 A Howick raupo or reed hut was a move up from a tent. The scheme was largely bungled as the Howick site was selected because the land was cheap and not because it had strategic advantage. And the men and their families who were lured to New Zealand with the promise of land and a cottage ended up living in tents or reed huts for years before getting a drafty cottage half the promised size. But especially for the over 600 Irish that came during the Potato Famine years, it was better than being back home and none of the fencibles returned to Ireland. The life expectancy of the Irish fencibles doubled from living in New Zealand over that of their peers living in the old country. Escaping the squalor of the Industrial Revolution drove other British retired soldiers to migrate to New Zealand. Lucky for everyone, the Maori never attacked and over all, it was considered a successful scheme for promoting immigration if ill-conceived in other ways. The current Village is a collection of about 30 original cottages relocated with the intendion of educating visitors about life for the early colonists. It was an exhibit that in some ways didn't have a lot to work with as 150 year old household relics aren't all that novel and rare, but it held our attention for hours more than we expected. The information boards in each of the indoor and outdoor displays went into greater detail than is usually the case. We've admired many an old millstone in the last 6 years, but the Howick display explained more than we'd ever learned before about the furrows carved into the stone and the need to deepen them periodically and how the flour bags were often more prized than the contents because of the scarcity of fabric. We've seen scythes in museums and in use on Alps hillsides but never had we heard than a skilled user could cut an acre in a day and that 1 of 4 different blades was selected depending upon the crop cut. At each turn, there were new little gems of information that made this snapshot of life in the 1850's more interesting than others we'd seen from the era. The next riding day was a pleasure despite the 3200' gain in 42 miles--it didn't rain and the less ferocious winds didn't warrant pulling out my new wind gauge. The dark clouds threatened and I thought I heard rain drops many times, but it never materialized. And by evening, the sky was the clearest we'd seen since arriving in New Zealand a week earlier. Dozens of mangrove root tips slurping up fresh air for the plant. When the Auckland 'burb traffic finally dropped away, we began understanding the enchantment people feel with the country. It's just plain pleasant. The relentlessly rolling terrain along the coast delivers constantly changing views that kept us from getting bored. The sight of one of the many inland canals; hilly panoramas speckled with curious but calm and clean sheep; roadside ferns that tower 2 or 3 stories high; and the unfamiliar calls of unseen birds made for satisfying touring. We expected to be able to ride for weeks or months with this type of scenery as a steady diet and be contented. We had feared that the need for making lodging reservations up to a week in advance, especially in the less populated areas, would spoil our spontaneity. But we quickly got a reprieve as we made a last minute turn into the spare looking Miranda Shorebird Centre. We knew nothing about it but hoped it would deliver some welcome nature-oriented tidbits. Their display boards went far beyond birds and described some of New Zealand's most unusual natural phenomena, like cheniers. 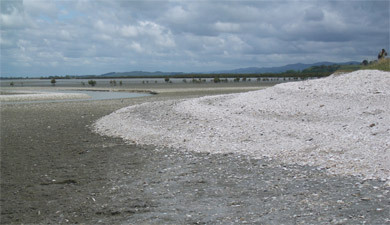 The cheniers are cockle shell banks that create mudflat plains behind them that allow mangroves to begin creating a suitable environment for less bizarre plants to take hold. 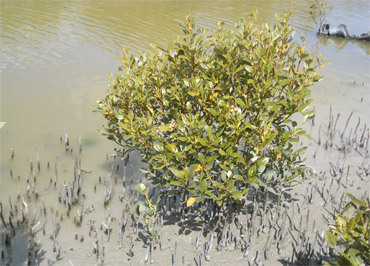 Mangroves are very special in that they generate a giant mat of shallow roots in the salty muck that send up special accessory roots into the air to get the needed oxygen that is unavailable in the saline soil. We were captivated, learning about the cheniers and then braided rivers. Next we were stunned to learn that some birds have magnitite glands that help them navigate using the magnetic fields of the earth. A chenier of cockle shells. Even though it was a shorter riding day, we felt a need to break away and get to our night's lodging. But one thing lead to another and we discovered that the Centre had lodging like the campground cabin we'd rented the night before (but with the welcome addition of some heat and a private bath--for less money). The Centre hostess gladly let us borrow her phone to determine that we could cancel our reserved campground cabin for the night that was double the price. Suddenly we were spending the night at a birder haven and had time to take the nature walk to see some of the phenomena we had just read about. All of that combined with the grand New Zealand geology book and bird identification flip chart made us feel back in control of our itinerary--at least for a day. Our stay at the Shorebird Centre jump started our bird watching from the usual sightings of city pigeons, little brown birds, gulls, and mallards to include a white heron, dozens of white-faced herons, several pied shags, and even more pied stilts. Over the next days, we were pleased to recognize a black-form Varied Oystercatcher with its brilliant orange beak, a kingfisher, and a pukeha (all of which eluded our camera). It only took a few hours in New Zealand before we found ourselves making comparisons with Iceland and the museum education reinforced the links. The most striking similarities seemed to be driven by both countries being small, contained, and isolated, with recent histories of settlement by Europeans and eventual prosperity. Iceland and New Zealand have similar geographical and geological backgrounds with volcanoes, glaciers, fjords, and their proximity to the poles. All of those elements contribute to the natural beauty they share, a beauty which attracts outdoors-oriented tourists to both islands. Bill's close-up of a pied Shag. Both islands were devoid of human occupation until ambitious mariners established settlements about a 1000 years ago, with the Vikings settling Iceland and the Maori ancestors settling New Zealand. They have similar social histories as their relatively small current populations were under the rule of Europeans outsiders until 1940's, though with 1 big difference: Iceland was originally settled by Europeans and then dominated by outsider Europeans until the 20th century; New Zealand's initial human settlement was about the same time, but by Polynesians whose heirs were dominated by Europeans in the middle of the 19th century. Both cultures were basically subsistence living until the late 19th or early 20th century, with the sheep raising industry increasing over the decades and then rapidly changing as the rural folks moved to the cities in recent years. Both islands have very high prices, even on locally produced goods. And both receive tourists with open arms and have special bus systems that have evolved to support campers and hikers and some unique lodging arrangements to help out budget travelers. One immediate difference between the 2 islands was the climate induced vegetation differences. Iceland's oldest living tree was planted in the 20th century and new little stands of trees are their pride and joy. In contrast, New Zealand has an abundance of flora and fauna, with some of the trees having ancestors dating back to Gondwana. And the heavy sweet scent of honeysuckle now growing wild along side the road; the enormous, near tropical Bird of Paradise plants in bloom; and the giant date palms made it clear that this wasn't Iceland, despite the other similarities. The relatively small populations is reflected in the road systems of both island nations, and on both we encountered many one lane bridges, even on primary roads frequented by freight trucks. Another marker for a smaller and less dense population was the frequency of drivers making U turns--something that you have to be ready for at any time in both countries. Both Iceland and New Zealand have smaller towns that, rather than look charming, look like they came out of the old US TV show "The Twilight Zone." They are old boom towns that have survived and are making awkward looking attempts at becoming gentrified. 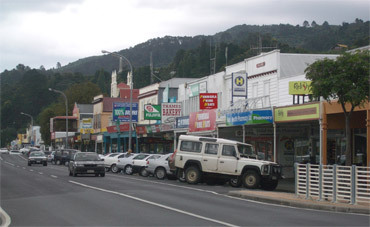 Places in New Zealand like Thames and Coromandel Town in the north were boom towns during the gold rush days in the mid 1800's and still look like they are stuck in the past--perhaps the 1950's. Most of the downtown businesses are 1 storey, with a few 2 storey buildings. Most of the homes are modest, square abodes without foundations and with corrugated sheet metal roofing. Most look like they have seen better times recently, as most are very tidy, in good repair and freshly painted. But they still looked locked in the past to us, just like small, old boom towns we've seen in Alaska and in Iceland. We noticed the easy going affect of New Zealanders before we left the Auckland airport and it drew our attention daily thereafter. Watching the TV news our first few days in the country highlighted it even more. The blunt side-comments during the coverage of the US mid-term elections had us simultaneously laughing and gasping at opinions that would be far too indecorous for the US nightly news. We were also stunned at the chuckles amid the news host banter about their preferred modes of execution for Saddam Hussein at the conclusion of his trial. A TV ad sponsored by the New Zealand tourist board made a crack about the kids enjoying the scenery in New Zealand as one was shown puking by the side of a winding coastal road. A casual frankness in New Zealand displaced the relatively stiff correctness we expect to see on TV. Telephone poles intentionally set in the sea. And that readiness to be disclosing in the media made me take a second look at a billboard-sized real estate "For Sale" sign that stated "Ignore all previous prices, vendor will meet market." 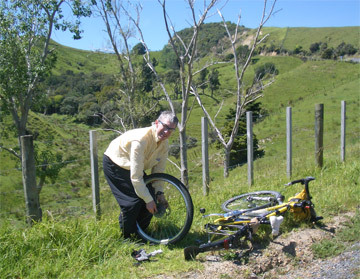 A few days later the city limits welcoming sign read: "Coromandel welcomes careful drivers. We have 2 cemeteries, no hospital." And a very accommodating wood man's posted sign read: "Drop off your trailer, pick it up on the way home" presumably loaded with firewood. New Zealanders also kept turning our heads with some of their own solutions to problems, like a common breakfast menu item being spaghetti on toast (we assume canned spaghetti). Another independent-minded approach that caught our eye was stringing the telephone wires over the ocean on poles set in the ocean floor: "But, but, but...you just don't do that...." was all we could think at the sight of them. And the topics that get time on the news are a little different too. A recent big story was the spotting of several icebergs now visible from New Zealand that broke away from Antarctica 5 years ago. That story got nightly coverage for over a week, including interviews with folks paying for a fly-by over the bergs. In this era of too much eagerness for "regime change" we were disappointed to learn that a number of island countries in the region, like Fiji, the Solomon Islands, and Tahiti, have volatile political situations that New Zealand is trying to recruit the US into solving. On a lighter note, we have to give the Kiwi's credit for innovation in the souvenirs department for the chess set with the play pieces being fanciful sheep and another board game using sheep and sheep dogs for the playing pieces. The concept was better than the execution or I might of had to buy one as sheep have become an icon for our travels. Though the scenery our first days on the road in New Zealand was very pleasant, there weren't many distinctive tourist sights to visit, so we started digging a little deeper to find some. Our figurative digging quickly yielded a literally large hole: the still active open pit mine at Waihi Gold Mine on the Coromandel Peninsula up north. 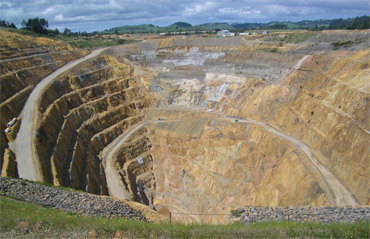 The open pit gold & silver mine at Waihi. A huge seam of gold and silver was mined from the 1870's until the early 1950's at the site of the open pit mine. In the 1950's, the internationally noteworthy, discreet seam was tapped out so since then the smaller seams have been accessed using open pit mining. At today's rates, a yield of 1 gram of gold per 1 ton of ore is economical mining here and they produce about $1million of gold a week from the ore in this mine. The end of our second week in New Zealand had us wanting to leave. Unlike the previous rainy, blustery, days, now there was no let up. Before, we could always count on the weather changing in an hour or 2, but not on this day. The only variation was in how hard it rained and in how hard the wind blew. Fortunately, it was planned as a short day, as we were desperate to get off the road. It wasn't suppose to be like this: we'd traveled to the southern hemisphere to escape the trials of winter riding only to be clobbered by this hideousness. We did have to admit that it was spring and not winter weather as the temperature was in the low 60's instead of the 30's or 40's as it might have been at home or in Europe. But nonetheless, it had all the cyclists scattering. We'd seen 2 other pairs of cyclotourists that day and they were all stopped under an awning in our destination town in the early afternoon when we arrived. The German couple we'd seen several times were bagging it and arranging to take a bus to wait-out the storm for a couple of days in the bigger, inland city of Rotorua. The NZ couple were pressing on for the rest of the day but instead of camping as usual, were going to hole-up at the home of a friend to wait out the weather. Having a week's worth of reservations lined up, we resigned ourselves to sticking to our plan and heading out into another miserable day in the morning. Our compromise was to decline to stay at the very sorry looking hostel where we had reservations for the night and get a roomier motel with a heater to sooth our nerves and dry our gear--thank goodness the hostel hostess let us cancel without a penalty. We couldn't believe the next day would be so terrible as our limited experience had shown NZ weather to be incredibly changeable, and changeable multiple times per day. We just hoped we were right as the next day was almost twice the mileage, once again dictated by the sporadic clustering of lodging. By dinner time, the rain had finally stopped and discrete clouds were visible and by nightfall, we'd spotted several patches of clearing sky and the non-stop winds had slowed to breezes. We wondered if we'd see the other cyclists on the road in the morning. Dry but still discouraged by the weather in general, we headed out the next day hoping for an improving trend but this November would prove to be an especially bad one from a weather standpoint. We were pelted by wind accelerated rain drops several times the next day but the weather did finally improve with a combination of a change in weather systems and moving into the typically warmer and drier Bay of Plenty region. But it was hopping from the frying pan into the fire as now we were in fierce freeway-like traffic for the next several days. The truck and trailer rigs charged by in packs, with many being loaded log trucks. The combination of their fast speeds, the narrow lanes, and the ever-present winds made for stressful riding. And New Zealanders, whether in cars or trucks, aren't too gracious about sharing the road and tend to ride the white line regardless of the absence of oncoming traffic. Every 4 miles or so we pulled off the road to let the tension ease in our bodies from straining to control the bikes so precisely and to let the roar of traffic drain out of our heads. Talking with each other was out of the question most of the time because of the steady din of engines and wheels on the unusually noisy asphalt. At least there were usually shoulders on the roadways, unlike on previous days, but they narrowed down to nothing on the frequent small bridges. Vehicles rarely slowed to accommodate changes in the conditions and we crossed our fingers at each bridge hoping to make it over without a truck passing in each direction. Only once in several days of riding did a car slow to help us out in a tight situation. An hour delay to unwrap a jammed chain didn't help matters. The assaults on our nervous systems took an irksome turn to more direct confrontation with some motorist pitching their greasy French fries slathered in ketchup on us. I took the brunt of it on my shoulders and we immediately pulled off the road to wash off before the afternoon sun set the stains for good. Angry and violated, we scrubbed the mess from our clothes and bikes with the detergent stored on Bill's bike frame and our drinking water. Had the glop landed on our faces and obscured our vision, we could have been hit by one of the vehicles in the stream of heavy traffic before being able to stop on the uneven shoulder. New Zealander's have been very friendly but as with more serious crime, they seem to be in denial about the bad behavior creeping into their world. When we've been assured on the phone by a lodging host that there is a secure place to keep the bikes at night, it often turns out to be leaning on the building in their front yard. Not locking homes and cars as been the norm, but that is changing. Each night the TV news has the body count like everywhere else, with a honeymooning Dutch couple being abducted, sexually assaulted and having their bank account looted with their stolen ATM cards just after we arrived. Men wielding machetes at shop owners; tying up and beating to death a man in front of his young son at their home; and the other more usual murders dot the news. It's hard for us to accept the reassurances "Your bikes are safe here" with the crime we hear of in the news and the absence of any bikes sitting outside other than those with a hefty coating of rust. No doubt the overall crime rate is low but I suspect that the rate of increase is higher than many want to accept. I have ratcheted up my personal security measures back up to their usual places in the last few days after initially having accepted the story about how safe New Zealand is--or used to be. We were disheartened that our next evening's host didn't seem surprised by the 'ketchup & fries" incident, suggesting that he was familiar with such bad behavior in his area. We were even more disappointed at his quickness to discredit Bill's planned coastal route that included 8 nights of reserved rooms. Despite the accolades of our local bike touring guide book, the host emphasized that only 2 of the days would be in sight of the ocean. Back to the drawing board that night and after hours of research, a new plan emerged at bedtime. We would turn inland in the morning, heading almost due south towards Rotorua, a tourist hot spot. 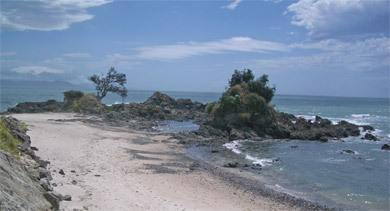 Ah, a clear spell coincided with beautiful coastline. With almost 2 weeks of plodding along the eastern seaboard of the North Island and another week planned, we could see that 4 months wasn't enough to loop around the perimeter of both islands at our sustainable pace. Turning inland now would take us to the tourist hot spots that we planned to pick up on the way north to Auckland in February, thereby clearly setting aside 10 of our 17 weeks to see the more scenic South Island. The downside of the new plan was heading into worse weather in the mountains and missing a week's break in heavy traffic by being in an isolated area. But the new strategy would ensure seeing the best of New Zealand in our allotted 4 months so as not to feel compelled to return. The daily doses of steep roads, persistent winds, and calling ahead for reservations were so far conspiring to kick New Zealand off our short list of places to winter over in the future. The pleasure of cycling was definitely suffering from the lack of freeways to funnel off the truck traffic and the general lack of back roads, forcing all of the traffic together on the overtaxed 2 lane routes. The final decision would come at the end of February, but New Zealand was rapidly moving on to the "once is enough" list for being seen by bike. But despite our disappointments, it still ranks high on our list of places to see by 4 or more wheels. Our turn inland towards Rotorua was a success and we've just wrapped up our tour of the volcanic region of the central portion of the North Island. We are continuing to work our way south towards Wellington where we'll catch a ferry to the South Island.